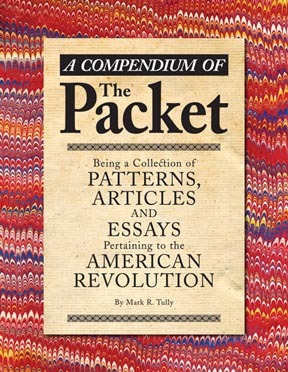 The Packet series has been replaced by this all-in-one edition featuring the complete text of ALL FIVE books in the original Packet series, plus 34 pages of additional material that had been destined for The Packet VI. More than just another "sketchbook," A Compendium of the Packet contains completely documented, illustrated and footnoted articles full of great information for the re-enactor or 18th-century scholar. Articles include: Military Rations, Camp Kettles, Camp Cooking, Tent Pins, Penny Knives, Shot Pouches & Bullet Bags, Anatomy of a Musket, Hand Barrows, Camp Furniture, iming/target practice, Camp Tools, Crime & Punishment, Eating Utensils, Health & Hygiene, Knit Caps, Soap, Laying out the Military Camp, Military Shoes, Bayonet Belts, Mittens, Canvas knapsacks, Fire Buckets, Military Markings, Forage Caps, Markets, Field Defenses, Military Dress, Liquor Recruiting, Musket Accuracy, Cartridges, Whistles, Camp Diversions and Games, Music, Ready Money, Quill Pens, Waistcoats, Laundry, Handkerchiefs, Sticks and Canes Floor Cloths, Pothooks, Gallipots, Life Expectancy, Post Roads, Folding a Letter, Colonial-era Signboards, Keeping it Corked, The Royal Arms, Shooting Flying, Bird Calls, "Approaching", A Canoe Paddle, The Kitchen Garden, Leggings, Covered Butons, Watchman's Rattles, Fire Starting, Lanterns, Indentured Servants, A Grand Tour Tattoos,Colonial Firefighting Old Raree Show, Canine Companions, Tea, Snowshoes, Chocolate, Snuff, Mugs, Jugs Pots and Cans, Parlor Games and more. 254 pp. Index. Complete bibliography.